Five years after the original virus outbreak, Milla Jovovich’s Alice joins the post-apocalyptic search for a legendary haven known as Arcadia. 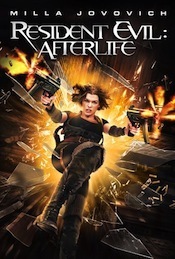 Original Resident Evil director Paul W. S. Anderson returns to the director’s chair in this fourth installment (and first 3D effort) of the franchise. Innovative composers Andy Milburn and Thomas Hajdu – known collectively under the moniker tomandandy – remain true to the epic, industrial intonations of previous Resident Evil films with this smooth, rhythmic set of moody cues. From the heavy, rock accent of "AxeMan" to the cool, voyeuristic suspense groove of "Binoculars" to the ethereal and mellow “Discovery,” tomandandy delivery a full-spectrum sci-fi-action film underscore. Electronic, ambient, dark, and foreboding. Drones create a melancholy, gloomy mood. Foreboding, dark, and energetic with distorted guitar and driving electronic percussion, creating a frantic feel. Dark, foreboding, and sinister with atmospheric electronic elements and drones. Driving, edgy and aggressive with distorted guitar and driving rhythms from the drum set and electronic textures. Determined, foreboding, and dark with electric guitar, driving percussion, and drones. Dark, somber, and foreboding with drones that create a sense of suspense. Sinister, ominous and devious with atmospheric electronic textures creating a suspenseful build. Ethereal, smooth, and introspective with minimal electronic elements and drones. Building, driving and determined rocktronica with distorted guitar, atmospheric elements, and electronic drums. Aggressive, edgy and threatening with heavy drum beats creating a violent effect. Dark, and sinister with driving rhythms from distorted guitar and electronic atmospheric pulses. Gloomy, melancholy, and ominous with reflective sounds of piano and drone swells create an eerie feel. Aggressive, edgy, and rebellious with distorted guitar and driving drums. A somber, gloomy introduction with introspective sounds on electric guitar, driving toward a sense of resolution and calmness at the end. Driving, determined, confident and bold in the genre of Rocktronica and a mixture of ethereal, ambient sections interspersed through out. Dark, driving, and haunting with a rock groove and a slow build to the end. Features distorted guitar, drones, and atmospheric elements. Aggressive, edgy and driving with distorted guitar and break beat drums. Aggressive, edgy, driving with atmospheric drones, distorted guitar and pulsing electronic elements. A bleak, gloomy, dark introduction with mixed choir and drones creating a build in tension in the middle section at 0:50.